CAMDEN, N.J., April 4, 2019 /PRNewswire/ -- On Wednesday, April 3rd, Subaru of America Inc. celebrated the completion of the 2018 Subaru Share the Love Event with a ceremony for its four national charity partners at the automaker's new Camden, NJ headquarters. The event was hosted by President and CEO, Thomas J. Doll. Addressing the CEOs of the four national charity partners, the American Society for the Prevention of Cruelty to Animals® (ASPCA®), Make-A-Wish®, Meals on Wheels America and the National Park Foundation, Doll and Subaru employees presented each charity their respective donation check, which as a result of Subaru customer's selections, combined to a total of more than $10 million this year. The 2018 Subaru Share the Love Event raised a total of $27.5 million for national and local charities. Over the last 11 years, through the Share the Love Event, Subaru of America and its retailers have donated more than $145.7 million to national charities and over 1,170 hometown charities. 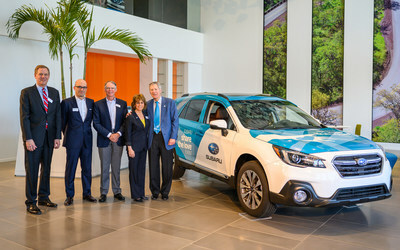 Will Shafroth (left), Matt Bershadker, Richard Davis, Ellie Hollander, and Tom Doll wrap-up the 2018 Subaru Share the Love Event with ceremony at Subaru of America, Inc. headquarters, Camden, NJ on April 3, 2019. "We support causes that our customers care about, and for the past few years, we have selected the ASPCA, Make-A-Wish, Meals on Wheels and the National Park Foundation as our national charity partners for the Subaru Share the Love Event," said Tom Doll, President and CEO, Subaru of America, Inc. "These organizations generate a positive impact in our communities nationwide, which is why we believe it is critical to raise money to fund their mission. We could not be more grateful to each of these organizations for all the work they do to make people's and animal's lives better each day." The check donation ceremony featured speeches by Matt Bershadker, President & CEO of the ASPCA; Richard Davis, President & CEO of Make-A-Wish America; Ellie Hollander, President & CEO of Meals on Wheels America; and Will Shafroth, President & CEO of the National Park Foundation. To bring the ceremony to an end, Doll made a surprise announcement revealing an additional donation of an all-new vehicle to each of the four national charity partners from Subaru of America. The donation, which embodies the automaker's spirit of supporting good causes and local communities, will help drive engagement from current and new donors by serving as a creative incentive for sweepstakes and contests. The automaker will donate the vehicles this Fall. A leading voice for animals for over 150 years, the ASPCA® provides life-saving protection and care to animals in need. Whether it's rescuing animals from abuse and neglect, introducing and enforcing more humane legislation, or supporting animal shelters across the country, the ASPCA helps animals live better lives. Through the ASPCA, the Subaru Share the Love event has had a significant impact on the rescue, transport, and adoption of more than 50,000 animals across the country. Research shows when children diagnosed with a critical illness are granted their one true wish, it gives them renewed strength and energy to keep fighting. Their families and entire communities come together. The impact from just one wish, has the power to transform the lives of everyone involved. Through Make-A-Wish, the Subaru Share the Love event has granted the wishes of more than 1,800 kids with life-threatening medical conditions. Meals on Wheels America provides leadership to local, community-based programs dedicated to fighting hunger and isolation among our nation's homebound seniors. Through Meals on Wheels America, the Subaru Share the Love event has helped deliver nearly two million meals to America's seniors. The National Park Foundation, in partnership with the National Park Service, enriches America's national parks and programs, safeguarding our heritage, and inspiring generations of national park enthusiasts. Through the National Park Foundation, the Subaru Share the Love event has provided funding for critical programs and projects in more than 100 national parks and helped increase public awareness and engagement across our National Park System.